Cordyline australis ‘Red Sensation’ has the same nice features as C. ‘Red Star’ only C. ‘Red Sensation’ has bronze leaves. With it’s long, tropical looking leaves, Cordyline ‘Red Sensation’ is an exceptional plant to use for height and texture in container plantings. Red Sensation Cordyline has a bronzy red foliage and grows to about 36 inches tall and it’s leaves are longer and more narrow than that of the Dracaenas. Cordyline or Cabbage Palms are hardy, where Dracaenas are not, so don’t be afraid to pair it in the border next to larger leaved plants. 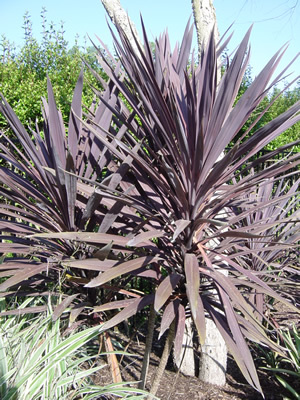 Cordyline ‘Red Sensation’ needs good light to maintain it’s color and don’t let it dry out between watering. Great for use in borders, beds, and containers.